MELVILLE, Sask. - Highways closed and communities declared states of emergency on Sunday after a deluge of rain drenched southeast Saskatchewan and parts of Manitoba. Melville, about 140 kilometres northwest of Regina, declared a state of local emergency after rain overwhelmed the city's storm and domestic sewer systems, as well as its lift stations. The Saskatchewan government said the Town of Carnduff, the Rural Municipality of Mount Pleasant and the Village of Maryfield have also declared local emergencies. The government warned that about a dozen other communities were in the process of doing the same as heavy rain continued. Moosomin mayor Larry Tomlinson said close to a third of his town was suffering flood damage and that the rain was still falling Sunday afternoon. "Part of our town looks like lakes," said Tomlinson. "We'll just try to keep up to it. It's all we can do." RCMP said many highways were closed and that secondary roads were also impassable. One bridge on Highway 55 in Saskatchewan had washed out. And Highway 1 was closed near Wolseley because it was under more than a metre of water, police said. As the sky continued to let loose, patients in a health centre in Gainsborough in the R.M. of Mount Pleasant were moved out. Later Sunday, firefighters went door-to-door advising everyone to leave. "Right now the last road out of Gainsborough has about four inches of water over it and the village is flooding itself," said Kris Carley, the emergency measures co-ordinator for the rural municipality. The village's mayor said residents were going to evacuation centres in nearby Carnduff or had gone to stay with relatives. "There's probably 50 houses full of water," Vic Huish said, noting businesses were flooded, too. "It's going to be a disaster." John Fahlman with the Saskatchewan Water Security Agency said the storm came from the northern U.S. and hit the region near the Saskatchewan-Manitoba boundary the hardest. Some areas, he said, received almost 230 millimetres over the weekend. Tomlinson, meanwhile, noted that strong winds were also knocking out power to parts of Moosomin. That meant homeowners with electric pumps were left helpless until power could be restored, he said. "We've got some basements that have as much as three feet of water in them," he said. "It's not great." City officials in Regina reported the storm water drainage system was operating at full capacity. The city's fire department also tweeted that the sewage system was at capacity and that residents should avoid baths, showers, and even flushing toilets. The University of Regina responded by shutting off water to all buildings except its residences, and said it was evacuating most of the campus. In Manitoba, Brandon declared a state of local emergency due to overland flooding and flights at its airport were disrupted when the facility's main access road was flooded. Allison Collins, a spokeswoman for the city, said WestJet cancelled its flights to and from Calgary on Sunday and that the airline would evaluate whether flights would resume on Monday. 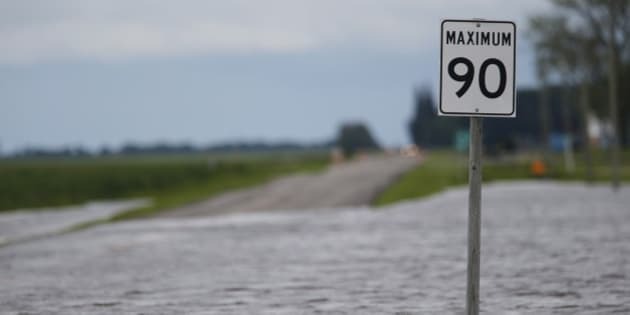 The Trans-Canada Highway west of Brandon was covered by 30 centimetres of water and police said late Sunday that it could close if the level continued to rise. Rain in Manitoba also flooded the RCMP detachment in Selkirk on Saturday causing it to lose telephone service. Environment Canada forecasts on Sunday called for rain to continue in the region through the day, the night and into Monday. Saskatchewan officials said the province is deploying teams to the affected areas and is collecting flood control equipment in Regina, which they say will help it cut response times for areas needing help. "We're focused on supporting municipalities as they support their citizens," said Duane McKay, commissioner of emergency management and public safety.